Do you ever find yourself at the dinner table and in need of some easy magic tricks to perform? In this collection of step by step instructions, you'll learn some easy magic tricks that you can perform with whatever you have around the table. No need to have a deck of cards on you or some exotic magic prop. Just check what's in front of you and it can be "magic." "The Spoon Bend" is a classic trick that every smart aleck needs to know. You grab any spoon, press down on it with your hands and appear to bend the spoon. As your stunned spectators register what you just did (the gall of you! ), you lift up the spoon and show that it is unbent, just as you found it. In the "Impassable Corks," you hold two wine corks that are seemingly interlocked and somehow pull the corks through each other. It's a fast, visual trick that you can also perform with rolled dollar bills and other objects of roughly the same size as wine corks. In "Coin Through Table," you cause a coin to somehow pass through the top of a table. For a great routine, follow this one with the coin vanish. You'll also need to learn a move that we teach in another lesson. This coin vanish is a great trick to do after coin through the table. 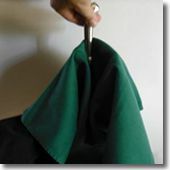 Just substitute a cloth napkin from the table for the handkerchief. In this easy trick, a coin is placed into a handkerchief where it mysteriously disappears. You can perform this one just about anytime, anywhere. All you need is a quarter and a handkerchief and that special secret. For the secret, turn to the next pages. "Cups Up" is a classic challenge that's more "sucker trick" than magic. It's a "do as I do," but because of the setup, your volunteer will fail at recreating your results. Using three cups, you perform three simple moves that leave all three cups with their mouths up. But each time a spectator tries to do this, the cups end-up mouth down. "The Vanishing Toothpick" offers an easy way to quickly vanish a toothpick in your hands.